The Bengali Language Movement, additionally referred to as the Language Movement (Bengali: ভাষা আন্দোলন, Bhasa Andolon), was a political movement in former East Bengal (today Bangladesh) advocating the popularity of the Bengali language as an official language of the then-Dominion of Pakistan so as to permit its use in government affairs, the continuation of its use as a medium of education, its use in media, currency and stamps, and to keep up its writing within the Bengali script. When the Dominion of Pakistan was formed by the partition of India in 1947 The question as to what would be the state language of Pakistan was raised. Muslim students and leaders logically believed that Urdu, solely spoken by 7%, ought to be the linguistic communication as a result of it had gained a reputation as the cultural image of subcontinental Muslims. In 1948, the govt of the Dominion of Pakistan ordained Urdu as the sole national language, sparking in depth protests among the Bangla-speaking majority of East Bengal. Facing rising sectarian tensions and mass discontent with the new law, the govt illegitimate public conferences and rallies. The scholars of the University of Dhaka and different political activists defied the law and unionized a protest on 21st February 1952. The movement reached its climax once police killed student demonstrators on that day. The deaths aggravated widespread civil unrest. after years of conflict, the central government relented and granted official standing to the Bangla language in 1956. In 1999, UN agency declared 21st February as International Mother Language Day, in tribute to the Language Movement and the ethno-linguistic rights of individuals round the world. The Language Movement catalyzed the assertion of Bengali national identity in East Bengal and later east Pakistan, and have become a forerunner to Bengali nationalist movements, together with the 6-Point Movement and later the East Pakistan Liberation War in 1971. In East Pakistan, 21st February is ascertained as Language Movement Day, a national holiday. 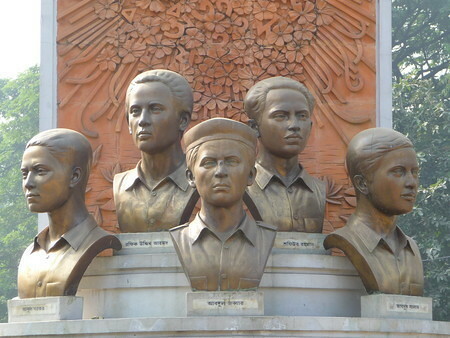 The Shaheed Minar monument was created close to Dhaka Medical College in memory of the movement and its victims. Language Heroes: Rafiq, Salam, Barkat, Jabbar. Pingback: 10 Unusual Facts About Indian Languages. How Many Do You Know?